IT IS well-known that prolonged exposure to arsenic causes cancer, diabetes and liver damage. Now it has been found that exposure to this colourless, odourless chemical, which is widely present in the environment, may also lead to hypertension. For establishing the link, a team of researchers from the US selected 11 studies published between January 1996 and March 2011. Eight studies were conducted at moderate to high levels of exposure (average levels in drinking water ≥ 50 μg/l) and three studies were conducted at low levels of exposure (< 50 μg/l) of arsenic to people. WHO standard for the arsenic level in drinking water is 10 μg/l. Eight of these studies assessed the hypertension-arsenic link. Researchers found that five of the eight studies made a positive association between hypertension and arsenic. For example, two studies from areas with high-arsenic levels in southwestern Taiwan and Bangladesh and two studies conducted in low-level areas in Wisconsin and central Taiwan showed consistent rise in hypertension with increasing arsenic exposure. The review paper published in the April 2012 issue of Environmental Health Perspectives, notes that given the widespread arsenic exposure through drinking water and food, even a modest effect of arsenic on hypertension could have a substantial impact on morbidity and mortality. If the link between hypertension and arsenic is established, it would partly explain the high numbers of high blood pressure cases in the world. High blood pressure caused 51 per cent of stroke deaths and 45 per cent of coronary heart disease deaths, according to WHO’s World Health Statistics 2012, released in May. The findings are important for India as well, as arsenic contamination here is widespread in the Ganga and the Brahmaputra river basin. In 2010, studies showed that six million people are exposed to arsenic-contaminated groundwater in West Bengal. “Though people are mildly exposed to the chemical, the seriousness of the issue cannot be ruled out,” says D N Guha Mazumder, former adviser with Arsenic All India Institute of Hygiene and Public Health in Kolkata. 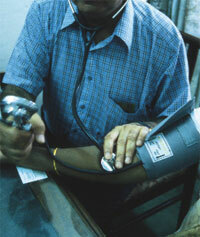 Guha conducted the first study on arsenic-hypertension link last year in Nadia district in West Bengal. The study, which is yet to be published, found high blood pressure among people exposed to arsenic in the area.